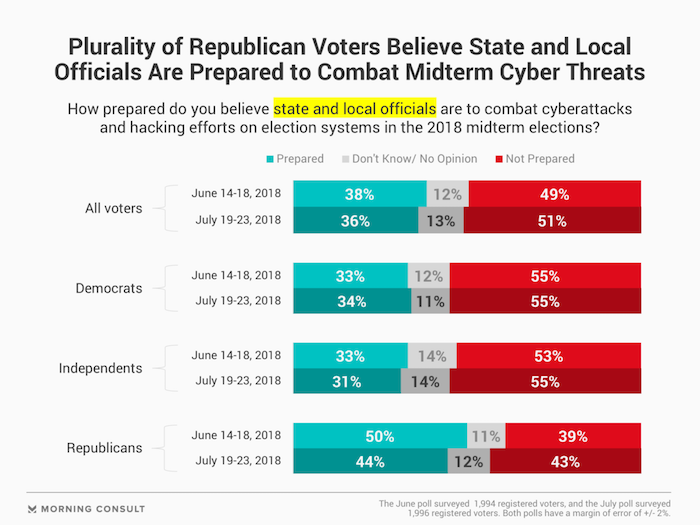 jobsanger: Is U.S. Ready For Another Election Cyber Attack ? Is U.S. Ready For Another Election Cyber Attack ? We are only about 100 days away from another election -- an election which will determine which political party will control Congress. And there have been reports that Russia is already beginning to attack our electoral process. Are we ready to stave off those attacks? Or are we vulnerable to the Russians possibly controlling the outcome this time? We know that Russia attacked about half of our states in 2016, getting into voter rolls. It's unknown if they actually changed any votes in 2016, but they no doubt have increased their capabilities since then. Could they now change votes? Even if not, could they now alter our voter rolls (which would also destroy confidence in the electoral results)? It's become obvious that Donald Trump doesn't seem to care about the cyber security of our electoral process. He's still denying that the Russian attack happened in 2016, and a recent meeting he had on cyber security showed that he has no plan to increase that security. In fact, he has eliminated the office of the White House Director of Cyber Security. Fortunately, the federal government doesn't control the voting systems in this country. That is done by the states and counties. Are they ready to defend our electoral process? Most Americans don't think so. Only 36% think state and local officials are prepared, while 51% say they are not. And the same goes for candidate campaigns and party committees -- with 35% saying they are prepared and 51% saying they are not. This is a serious problem. Even if a fair and secure election can be held, will the public accept the results as valid? If they don't, our democracy is in deep trouble. The charts above are from a recent Politico / Morning Consult Poll -- done between July 19th and 23rd of a national sample of 1,996 registered voters, with a 2 point margin of error.